You Give Feedback, We Make Updates! We’re really excited about the possibilities for Kabuto Live and are thankful for all of the feedback we’ve received about the Beta so far. – Some techs prefer to ensure that the client be prompted and agree to the technician performing repairs via Remote Access. – Other techs find the absence of Unattended Access very limiting, and they want to be able to Remotely Access client machines at will. We heard your feedback and made an update to Kabuto Live Beta that allows techs to set a specific window of time to control a Client Device with Unattended Access. With this update, you can now request access for a dedicated time of your choosing. 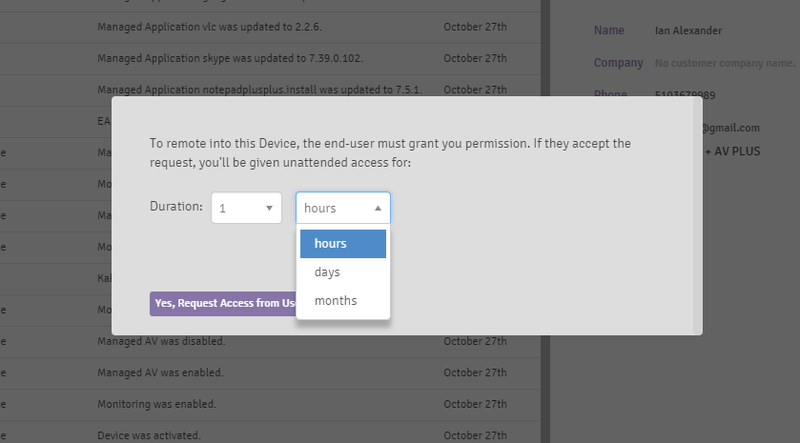 The first time you access a Device, the user must still approve it, but after that, you will be able to access the Device unattended for the entire duration of time that you previously selected. This means you can request access for any duration of time: 8 hours, 1 day, 5 days, 1 month etc. The maximum time limit is 52 months. Simply choose to remote into a Device as usual, and you’ll notice the addition of the time selection drop-down menus within the access prompt. We feel that this is a good compromise that enables both schools of thought, while maintaining the privacy of residential end-users. We really appreciate the feedback and we’re eager to keep making our products the best they can be. Again, if you have suggestions, ideas, or questions, please don’t hesitate to contact us at support@repairtechsolutions.com.